One master cabin with king size bed and ensuite separate his and hers facilities, located on the main deck. Two twin cabins with ensuite facilities, located on the lower deck (one of them with one extra pullman berth). Captain Dimitris graduated from the Merchant Marine Academy and holds a Captain Class A Diploma. Captain Dimitris began his career as Chief Officer on passenger ships, where he gained extensive sea-experience of world cruising areas. 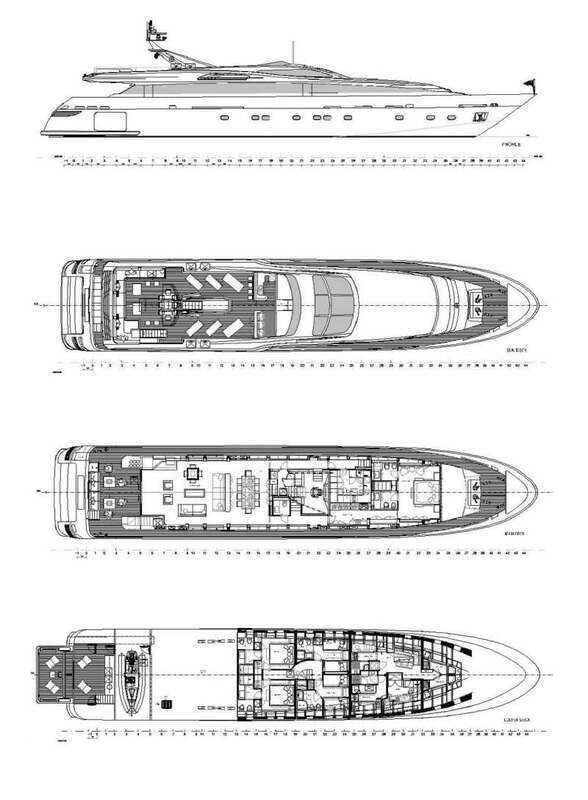 After years in passenger ships, he got involved in the yachting industry. Prior to joining M/Y BILLA, he has served as Captain on board M/Y MONACO (42m) and M/Y Ouzo Palace (30m). Captain Dimitris has been onboard BILLA since 2012. Captain Dimitris is known for his high level of expertise and professionalism in the luxury yachting industry. With an extensive knowledge of Greek Waters, Captain Dimitris knows all the secluded bays where guests can enjoy the dramatic surroundings or can find the perfectly calm waters and the safest exclusive anchorages. Captain Dimitris holds the following certificates: Medical Care on board, Tanker & LPG carriers safety cert, Ro/Ro & Passengers ships safety, Life Saving & Fire Fighting, Certificate of training in RADAR plotting, the use of RADAR & the use of Navigation Aids, ISPS. He speaks fluent English and enjoys sailing and travelling. He is 41 years old, married with two children. Dimitris is a graduate of the Greek Merchant Marine Academy and holds an Engineer Class A Diploma. He has sailed around the world on commercial ships for 27 years. Moving into the yachting industry has provided Dimitris with the opportunity of sharing his proud, fond experience of engineering and looking after the safety of the yacht and all aboard. He started his career on yachts on board M/Y ABOUT TIME, IFIGENEIA, ACTIVE GAZELLA and BAIT. Dimitris joined M/Y BILLA in 2009 when she was first delivered to Greece. He holds the following Certificates and Licenses: Ro/Ro & Passenger Ship Safety, Life Saving & Fire Fighting, ISPS Certificate (International Ship & Port Security). He joins us to compliment this department and to ensure that M/Y BILLA runs at her full potential at all times. He speaks English. Dimitris is 49 years old. After graduating from Chef D’Oeuvre, one of the top chef schools in Greece, Konstantinos started his career at leading hotels in Greece. He was employed as Sous Chef at 5 star Greek hotels, such as Royal Mare, Aldemar Hotels & Spa in Crete and Elounda Village, Aquila Hotels & Resorts in Crete. Further to his professional experience, Konstantinos has always been keen to expand his knowledge and abilities. He has attended various seminars, including courses on Japanese and Mediterranean cuisine. Konstantinos decided to join the yachting industry as he wanted to offer his services in a different and more private environment. Konstantinos is a creative person and is able to combine his modern ideas with traditional Greek products. He is excited to present his culinary extravagances to his guests. Konstantinos speaks English and Greek. He is 33 years old and single. Elizabeth began her career at sea on board private yachts. During the past 7 years, she has worked as a chief stewardess on board M/S Astarte, M/Y Ionian Princess, Stilvi 3 and Mira. Elizabeth has been always keen to have a long term position on a yacht where she can deliver excellent service and provide solid support to the rest of the crew. Since winter 2017, she has been on board Billa and is now a member of the professional team. Elizabeth speaks fluent English and loves swimming and traditional dances. She is 36 years old and single. After completing her studies in cosmetics, Stavroula decided to move to yachting industry on board Billa. Stavroula’s boundless energy and pleasant personality will help make your stay aboard Billa as delightful as possible. She holds all relevant certificates on fire fighting and lifesaving. She speaks fluent English. Stavroula is 26 years old and single. Konstantinos holds a Captain Class C Diploma and a high speed boat license. He started his career in 1993 on board tanker ships. Konstantinos has 7 years of experience on board various yachts such as M/Y Charlie and M/S Troia. Konstantinos joined M/Y BILLA in 2013. He welcomes the opportunity to instruct or assist in all water sports provided on board M/Y BILLA. Konstantinos is a hard working person with a pleasant personality. He speaks English. Konstantinos is 43 years old and single. John started his career in yachting, on board private yachts and joined M/Y Billa in 2016. He is a hard worker and his love for this yacht has made him a most valuable member of M/Y BILLA’s crew. John is always willing to maintain the yacht in excellent condition and provide his services to all guests on board. He speaks English. John is 42 years old.